Soft and gentle for your baby's sensitive skin, this collection is made from 100% Organic Cotton fabric with the comfort and ergonomics of our Original baby carrier. Best for: All-around everyday use for the green-conscious parent. Our Organic Baby Carrier offers parents and caregivers the option of 100% organic cotton (Oeko-Tex Certified). This carrier is a great choice for those who would like a carrier crafted with sustainable materials, and enjoy all the benefits of our Original baby carrier as well. 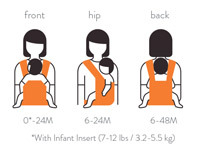 What is the difference between the Ergobaby Original Carrier and the Organic Carrier? The only difference is in the Fabric. Gentle for baby’s sensitive skin, our Organic carriers are made from 100% Organic Cotton Oeko-Tex Standard 100 Certified fabrics in a responsible, environmental manner with you and the planet in mind.